Size: 5.75 x 9 ins. Description: 32pp. Set in 16pt Centaur type. Printed on cream Abbey Mills Greenfield paper. 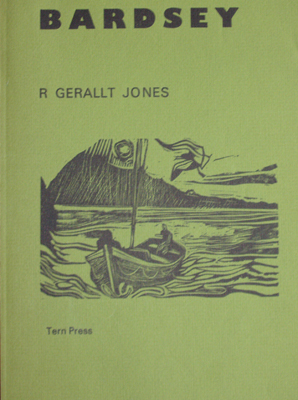 Bound in grey cloth over boards, with a lino cut illustration on the front cover and lettering on the spine. Illustrations: 8 linocuts by Nicholas and Mary Parry in brown. Description: 32pp. Set in 16pt Centaur type. Printed on cream Abbey Mills Greenfield paper. Bound in quarter leather over hand-made paper covered boards. Plain paper endpapers.No colophon. Page number 26 printed as "29"
No. of Copies: Deluxe Edition of 10. 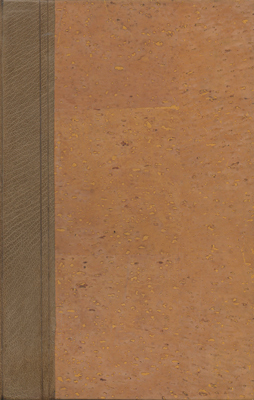 Comments: Copy has been identified with marbled endpapers. Size: 12 x 8.5 ins. Description: 24pp. Set in 36pt Centaur type. Printed on white cartridge paper. Bound in blue cloth. 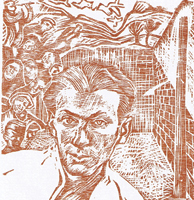 Illustrations: 10 etched linocuts in various colours. Size: X x X ins. Description: [64pp.] Set in 16pt Centaur type. Printed in brown on Dover hand-made paper. Bound in cork covered boards with a leather spine. Black printing on front board. 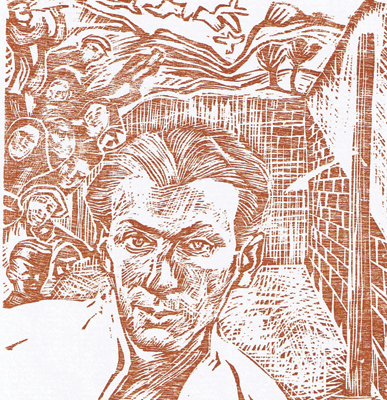 Illustrations: 41 linocuts in brown. Size: 8.75 x 12.25 ins. Description: 47pp. Set in 18pt Univers. Perfect bound in blue printed card wrappers. Comments: Signed by Nicholas Parry and Randolph Ellis. Colophon states 50 copies but this is crossed through and 100 written. Size: 9 x 11 ins. Description: 47pp. Set in 18pt Univers. Printed on Barcham G reen's Charles I hand-made paper. Marbled paper endpapers and bound in black leather. Comments: Signed by Nicholas Parry and Randolph Ellis. Colophon states 50 copies. Size: 8.25 x 11.6 ins. Description: [64pp.] Set in 16pt. Univers Medium type. Printed on Medway hand-made paper. Bound in printed green paper covers. 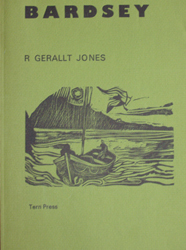 Comments: Signed by R. Gerallt Jones. Description: [64pp.] Set in 16pt. Univers Medium type. Printed on Medway hand-made paper. Bound in rough pigskin. Size: 6.75 x 10.25 ins. Description: [52pp.] Set in 16pt Delphin and 18pt Centaur type. Printed on Chilham hand-made paper. 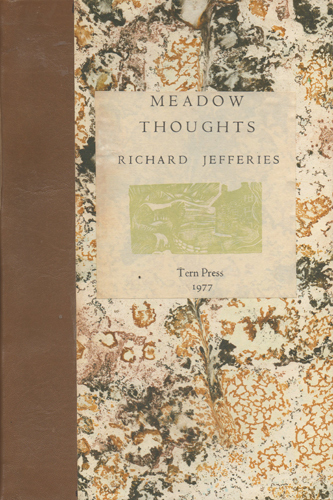 50 copies bound in marbled paper covered boards with a spine, lettered in gilt.Brown end-papers. 50 copies bound in full grey leather. 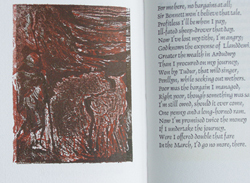 Illustrations: 5 two and three coloured etchings and cut linos by Nicholas Parry. Comments: Signed by Nicholas Parry and R. Gerallt Jones. Size: 6.25 x 9.75 ins. Description: [88pp.] Set in 20pt Delphin and introduction and notes in Centaur Italic type. Printed on Maidstone hand-made paper. 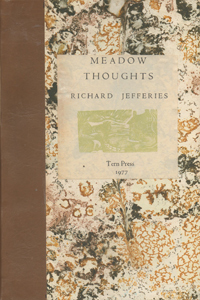 Bound in dark cream linen over boards with a brown leather spine with gilt lettering and a printed paper label to the front cover. Cream end-papers. Illustrations: 31 engravings plus three page illustrations dividing the book into three sections by Nicholas Parry. Comments: Some copies were bound in full leather. Signed by Nicholas Parry and Bill Griffiths. Description:[32pp.] Set in 12pt. Centaur type. Printed on Maidstone hand-made paper. 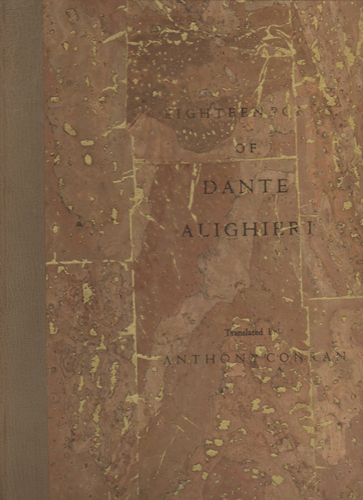 Bound in marbled paper covered boards with a brown leather spine. Printed paper label to spine and front board. No. of Copies: 80 numbered copies. Size: 6 x 8.5 ins. Description: [28pp.] Set in 20pt Delphin and 10pt Old Style type (title-page in 24pt Centaur). Printed on Dover paper. 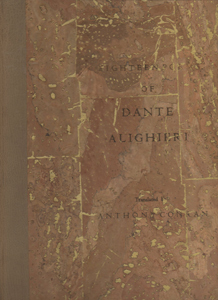 Bound in leather with design and title blind stamped on front cover. Illustrations:9 illustrations by Nicholas Parry. Comments: Signed by Nicholas Parry and John Porter. Size: 6 x 9.5 ins. Description: [60pp.] Set in 12pt Centaur type. Printed on Barcham Green's Charles I hand-made paper. Quarter bound in green leather with gilt lettering to the spine with printed grey paper over boards. Marbled paper end-papers. Comments: ISBN 0 906057 01 9 Translated from the Hungarian by Thomas Orszag-Land. Signed by Thomas Orszag-Land and Nicholas Parry. Also an edition in grey printed wrappers.